Marvel Studios finally debuted the fan-favorite character Carol Danvers to the big screen, showing the latest member of the Avengers in Captain Marvel. But many fans are excited about what it means for the future of the Marvel Cinematic Universe, especially for a young Pakistani teen from New Jersey. Marvel visionary Kevin Feige has confirmed that the MCU’s version of Kamala Khan wasn’t born at the time of Captain Marvel. Created by Marvel Comics back in 2013, Kamala Khan – a.k.a. Ms. Marvel – is one of the most popular of Marvel’s so-called “Legacy Heroes.” The teenager was inspired by Carol Danvers, and made history as the first Muslim-American superhero to headline her own book. What did Kevin Feige had to say? Marvel boss Kevin Feige previously said that Captain Marvel’s presence would eventually lead to the introduction of Kamala Khan AKA Ms. Marvel. But don’t expect to see her soon, because she wasn’t born during the film’s events that took place in ’95. Feige spoke with ScreenRant about including characters like Monica Rambeau and was asked if Kamala made an cameo appearance at any point in the film, much like her quick first appearance in the pages of the Captain Marvelcomic. This echoes what Feige previously told ComicBook.com when he referred to Ms. Marvel’s origin as a “contemporary story,” as well as what he previously said last year. What Actress Brie Larson has to say? Actress Brie Larson is also a huge fan of the character, saying that she hopes Ms. Marvel follows in the footsteps of her character and that Kamala’s introduction in a sequel is a goal. Presumably whatever happens in Avengers: Endgame will lead to Captain Marvel being seen by the people of Earth, and recognized as a hero who fights alongside the Avengers. 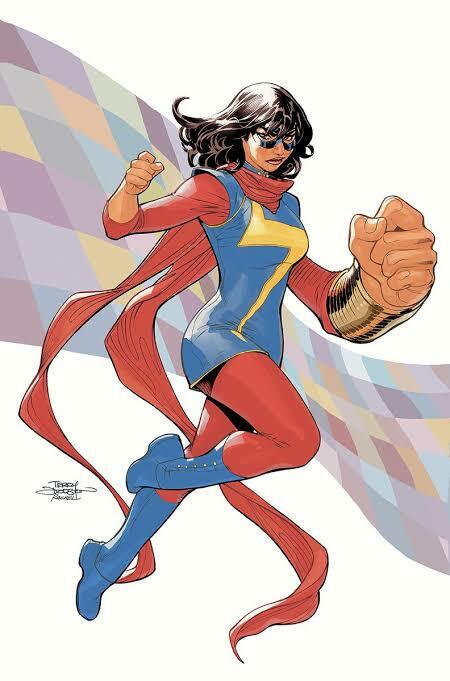 Feige has already indicated that he wants the MCU’s Kamala Khan to be comic-book-accurate, a young Muslim-American who’s inspired by Carol Danvers. The truth is that a comic-book-accurate Kamala Khan works much better in the modern MCU, rather than being rooted in the history of the franchise. Like the MCU’s Peter Parker, Kamala grew up in a world of superheroes and super-villains; but she drew particular inspiration from Carol Danvers’ heroism, and loved that a woman could stand alongside Earth’s Mightiest Heroes. When Kamala gained powers herself – the comic book version is an Inhuman, but that may be changed given Marvel Studios don’t seem particularly interested in the Inhumans – she took up the identity of Ms. Marvel in honor of her hero. To her delight, she’s earned Carol’s approval, and the dynamic between the two is a tremendously entertaining one. But Carol isn’t the only superhero Kamala loves; in fact, she participates in online RPGs in which she often ships the different Avengers. The more experienced heroes love her for her enthusiasm and idealism, even if they do sometimes disagree with her insistence on putting herself at risk.